Count on the Safest Industrial Electricians in Wichita for full industrial setting efficiency. What used to be a design afterthought is now an important planning aspect of any industrial setting: industrial lighting updates, upgrades, and last but not least, maintenance. Using precision light meters to measure illumination levels and computer-derived layouts based on luminary type and size, Young Electric will design and implement the most efficient industrial lighting fixture spacing required to achieve your desired light levels. We can also help compare energy efficient lighting technologies to evaluate the costs vs. benefits for your particular industrial electrical application. For instance, while T-5 fluorescent lighting is a very effective replacement for traditional high intensity discharge (HID) lighting solutions, LED lights provide the most energy efficient lighting with the best overhead maintenance (though they represent the most upfront cost). With our certified bucket truck service for parking lot lighting or any elevated exterior lighting, a well-lit space is never out of reach. We even keep an extensive inventory of common lamps and ballasts right on our bucket truck to maximize our efficiency, and manage your cost. 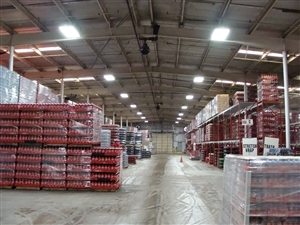 Coca-Cola commissioned Young Electric to conduct a lighting analysis to develop the optimal lighting atmosphere for pleasant visibility and fiscal efficiency.